Dynamic Setup builder software is designed specifically to facilitate you to create self-extracting executable files for installing software application on your clients PC or Laptop-Desktop system. Automated and time-saving installer provides a complete package to distribute executable files of any windows application among users in very minimal time. 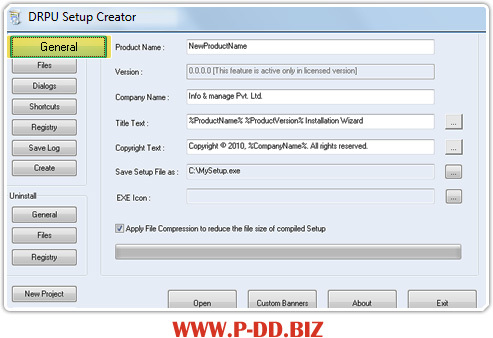 Compact setup creator is a complete solution to create single .EXE (Executable) file after downloading from internet or from various other sources. Award winning Setup Creator places all your program and data files into a single self extracting executable file which allows you to include desktop icons, License agreement dialogue box, Launch icon, and other items while creating professional setup of any application. Professional install builder offers interface for selecting the files to include in the package and specify installation paths, registry value etc. Smart Windows Software installation setup package creator program facilitates the process of creating and managing all patch files while any software setup delivery. Safe Windows installation provides easy uninstall feature which allows users to remove the program when not required anymore. Provides complete information about the software including name, version etc. with optional features to display desktop icons, placing of items in windows start menu. Best install and uninstall feature options of the software allows users to save or remove the program as needed. Provides full functional support to create window installation package which is very useful for Developers, Application programmers including other end users. Setup windows installer can be used for commercial and non-commercial programs and saves time on software deployment by creating installation packages in a matter of minutes. Interactive and easy-to-use GUI with step-by-step installation process to create setup packages.